National Nurse Practitioner Week is a weeklong event with the purpose of celebrating the NP profession and their contributions to the nation’s health. This week is important not only to the NPs who are honored, but also for increasing public awareness of the important role that nurse practitioners play in establishing proper access to primary healthcare services, as well as improving the health of communities. Nurse practitioners are highly skilled and trained clinicians who provide primary, acute, and specialty healthcare services. NPs can diagnose and treat illnesses, prescribe medications, and manage overall patient care. NPs play a very important role in community health and disease prevention, as they emphasize the importance of educating patients about their healthcare choices and guide them to healthy lifestyle choices. How can you celebrate National Nurse Practitioner Week? The AANP has prepared a sample NP Week proclamation, which is a document for elected officials to sign to officially recognize the vital role that NPs play in the healthcare system of our country. Send the AANP template, or a version of your own proclamation, to your state governor and ask them to sign. 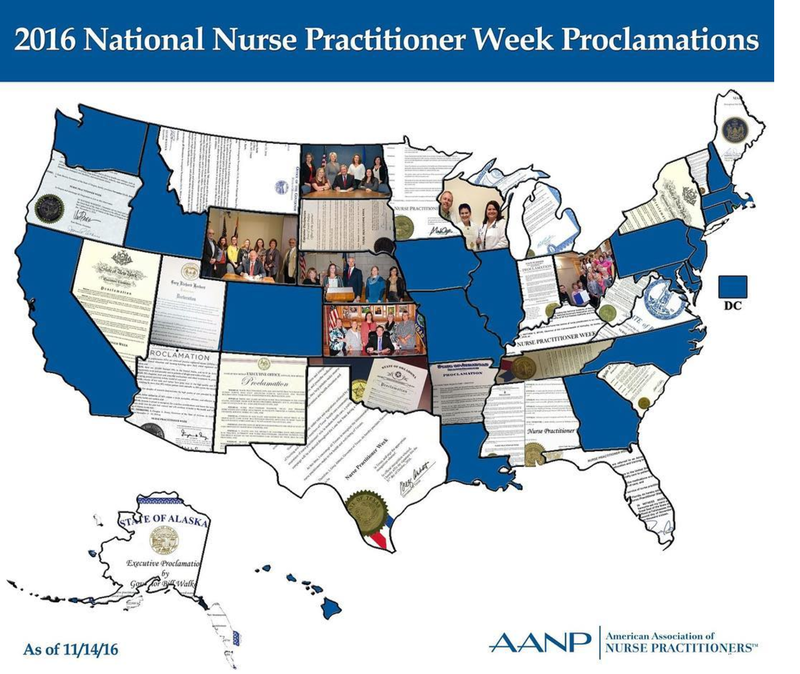 During National NP Week 2015, a record number of proclamations were signed and received, resulting in 39 state governors recognizing the exceptional contributions of NPs in their communities. This year, in 2016, Indiana has already become the first state to submit the first NP Week proclamation. 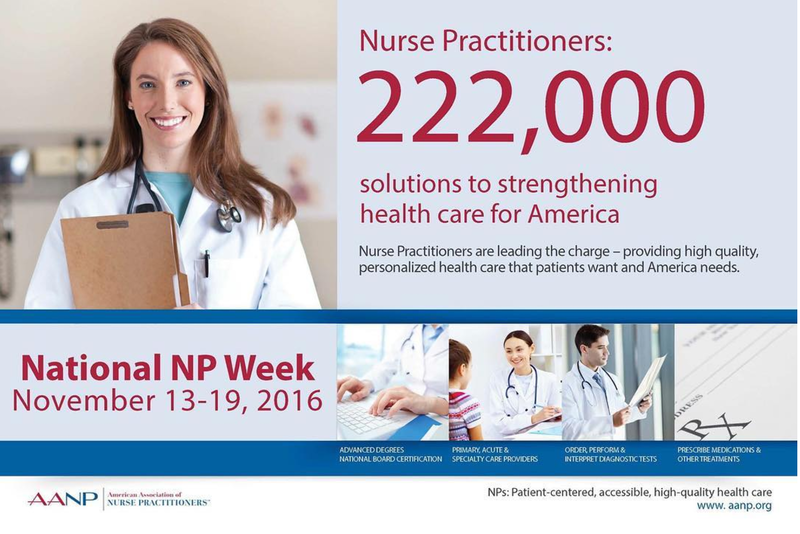 Last year related posts during NP Week were viewed by over 16 million people, thanks to the active discussion by NPs and their colleagues. Whether you are an NP yourself, a fellow healthcare professional, or even a patient, you can join the conversation on social media by using the hashtag #NPWeek on Facebook, Instagram, Twitter, or any other social media platforms. Nurse practitioners are the healthcare providers of choice for millions of Americans, but more public awareness is needed so that the public can properly understand what NPs do and why they are so important to the health of our communities. There are a number of ways that you can help get this important message out there. Send a news release to local media, write a letter to the editor of your community's newspapers or magazines, or even coordinate a media interview or rado public service announcement! You can refer to this fast-fact sheet with information about nurse practitioners to get an idea of key talking points to include in your message. NP Week is an excellent time to plan a community activity or networking event to celebrate the virtues of the NP profession and spread the word about the benefits of nurse practitioners and the exceptional, cost-effective health services they provide to patients. Coordinate and plan an activity with local hospitals and civic groups, including rotary clubs, charitable organizations, local schools, etc. These activities or events should be enjoyable but their message should be centered around the value that NPs provide the community - for example you can host a health fair at a local shopping center, distribute brochures and posters, coordinate a speaking event at a school or other public venue, or even plan a kid-friendly activity such as an NP-related coloring contest at local schools. You can also contact your local NP group to co-sponsor an NP networking event. For more resources including a sample proclamation, educational posters and brochures, and media contact guides, check out the resource guide provided by the AANP at this link.